Oh, for cryin' out loud! Have they ever been to Topeka? 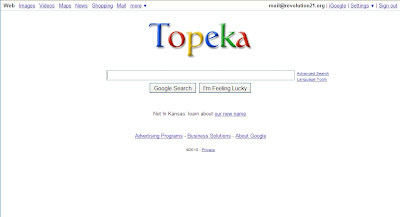 The Google people changed the name of the search engine this morning to pay tribute to Topeka, being that Topeka is now Google, Kan. What the people in Mountain View, Calif., don't understand, however, is the former Kansas Topeka's stunt wasn't a tribute to the former California Google -- it was straight up identity theft. The former Kansas Topeka's reputation had been catching up to it for a century and a half or so, so the crappy little city on the sunflower-mottled flatlands decided to cadge a new start on life by passing itself off as the world's premier search engine, etc., and so on. And now -- in a stunning fit of naivete surpassing what got it into its current Chinese misadventure -- the former California Google has saddled itself with the bad rep of the former Kansas Topeka. At 79, Bill Bunten doesn't exactly understand the Internet boom. The Topeka, Kansas, mayor has an e-mail account, he said, but his assistants take care of most of his online communications and tend to search the Web for him. Frankly, I thought that if Google ever renamed itself in honor of a Midwestern town, it certainly would have been after the Nebraska Omaha, a far superior locale than the former Kansas Topeka. But no. . . .
Not that it matters, of course. I n a press release embargoed until 10 a.m. today, Omaha Mayor Jim Suttle will announce that Nebraska's largest city -- indeed, the largest municipality between Chicago and Denver -- is naming itself after the search-engine and Web-services company that already has committed to his metropolis. 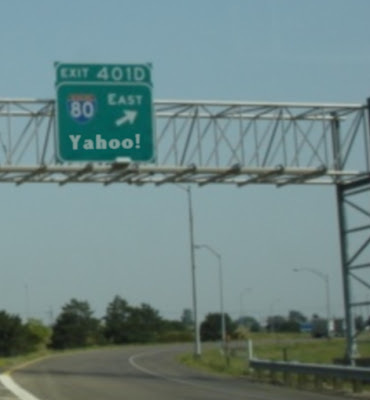 Effective at high noon today, April 1, the former Nebraska Omaha will be known as Yahoo! Neb. "For a long time, we thought the city had been selling itself short in the branding department with such a staid and, frankly, unintelligible name as 'Omaha,'" Suttle said in the release. "We think Yahoo! is a lot snappier. To our way of thinking, Yahoo! Neb., announces to the nation that we're the happiest sonofabitchin' place in the whole frickin' Great Plains region! "You got some vodka on you? Yahoo! Neb., needs some more vodka," Suttle added. "And its mayor could use another Screwdriver, g**dammit." IN THE press release, the president of the Yahoo! City Council, Garry Gernandt, agreed with Suttle that Yahoo! is a more upbeat, young-professional-friendly name than Omaha -- a Native American word meaning "streets of many potholes." "Besides, we just think that naming the city Yahoo! makes a nice place name bookend for Wahoo just down the highway," he said. "Why the hell should those Saunders Country clodhoppers have all the fun? I mean, holy crap!"